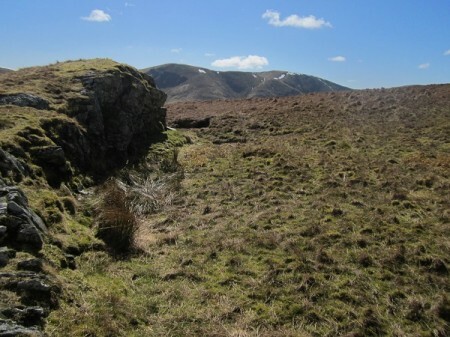 It can be very easy sometimes when you go hill-walking …..just to walk. 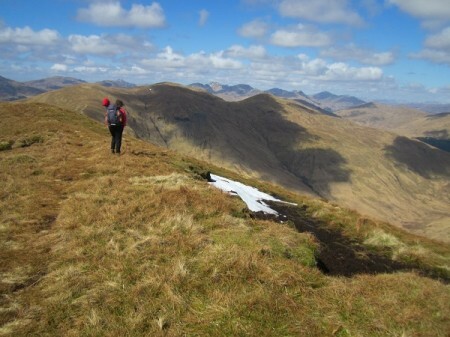 You have a route in mind, a special hill or series of tops you want to visit and you can get very blinkered into doing exactly that….quite often at a rush ….and then if it takes less time to reach your objective than you thought, to simply return. Or that is perhaps how I used to be many years ago when my sight was good, I was a few years younger and a good deal fitter! Things have changed since then, if for no other reason than I met and have spent the last 25 years living with a sensible woman who has never worried greatly if we don’t get to the top of a hill, or do all the route, or take a meandering course way out of our way, (whatever that was) to have a look over an edge or check out an interesting rock. In short, Nita has had a very good affect on me and I’m a much more relaxed walker than I think I used to be. Of course, the fact that I can’t see too much these days has also slowed me, (us) up a great deal. I simply can’t race up and down a hill any longer, even if I wanted to. As I say though, it doesn’t seem to bother Nita and our slow, slow pace is just something that we’ve taken on board and have adapted our walking style too. It gives Nita lots of time to look around, peer at strange plants or bugs and try, (usually without much success) to point them out to me! Yesterday was just the case. 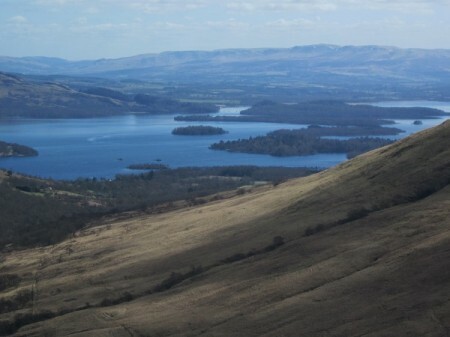 We’d driven up to Luss on the side of Loch Lomond and had planned to walk up the glen and then up onto Beinn Eich and then possibly continue over to the next hill. It really was a beautiful spring day ….the first one of the year maybe. It was warm and the sun was bright with just a few clouds bubbling across the sky and casting deep shadows across the brightly coloured landscape. It was perfect. The whole way up we were accompanied by the sound of Skylarks and other wee birds and it was about as peaceful as you can get. 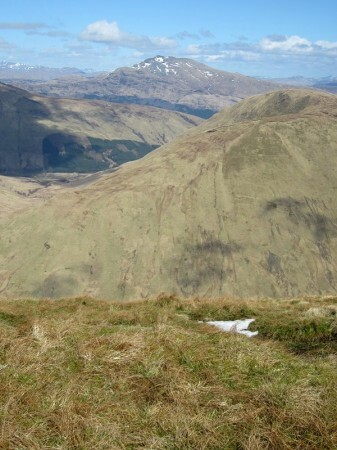 When we reached the summit and found a pleasant spot to sit looking out towards Ben Lomond, it was the obvious lunch spot and so we just sat down with this vast panorama in front of us. 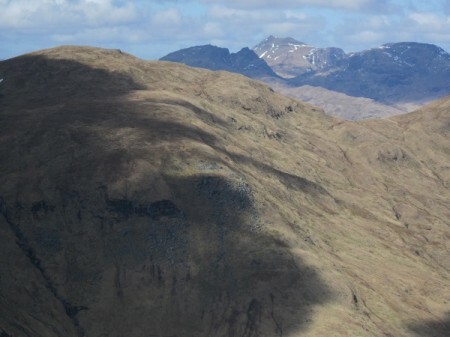 Beyond Ben Lomond was the full array of the southern Highlands, be-speckled with the last remnants of the previous months heavy snow and over to our left we could make out the distinctive shape of The Cobbler, Beinn Ime and Beinn Narnain. We just sat and looked, and ate, and drank our coffee and chatted ….and before we knew it ….two hours had gone by and it was 4 o’clock. Amazing, in the past I would have been hankering to rush on, but now I was happy just to sit and fully appreciate the wonderful location we were in ….as I say, sometimes walking isn’t just all that walking is about!